CHRIS BEARDSLEY insists manager Mark Cooper and his Kettering Town team-mates were the key factor in his decision to join the club permanently. The striker signed an 18-month contract with the Blue Square Conference North leaders yesterday and has joined on a free transfer from Conference Premier side York City. Beardsley has enjoyed a terrific loan spell with the Poppies this month with five goals in five games endearing him to the A-Line Arena faithful. And he admitted he was just relieved to get a deal completed as he met with Cooper and chairman Imraan Ladak after Saturday’s 2-1 win at Alfreton Town which helped extend their lead to eight points. Beardsley, who is set to lead the line again as the Poppies travel to Gainsborough Trinity tonight, said: “It’s good to get everything done now. “It became a bit of a circus last week with all the questions I was being asked and it’s just nice to have it all done and dusted. “The reaction from the players and managers were key for me. “If you have a good relationship with your team-mates and manager then it’s great and I have enjoyed working under Mark Cooper for the last month and, hopefully, we will be successful between now and the end of the season. “A massive factor in it was the club being full-time because training every day does give you an extra edge. “Our aim is to be in the Conference Premier next season and I hope I can help the club achieve that. York boss Colin Walker had originally expected Beardsley to return to the Kit-Kat Crescent after Saturday’s game. 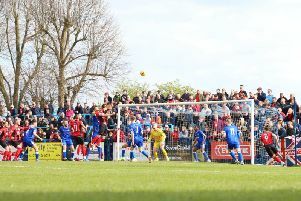 But with the Minstermen in sparkling form – including a 2-0 win over Aldershot on Saturday – it became clear that Kettering would get an opening to clinch the deal. Beardsley paid tribute to his former club and said: “Colin (Walker) has been great to me. He was honest and fair and the whole set-up up there is brilliant. Cooper, meanwhile, paid tribute to chairman Imraan Ladak after the deal was done. The Poppies boss said: “It’s a good signing for us and he is proven in the level above. “You have got be honest and say the chairman has done well to bring Chris in.